An easy, four block, dusty walk from the bus station, the Posada Con Los Angeles is wedged between other adobe buildings on Calle Gorriti, but it’s walls are painted salmon pink. From its exterior it hardly looks special. Yet through the old narrow wood doors, a hidden garden of delight is exposed. 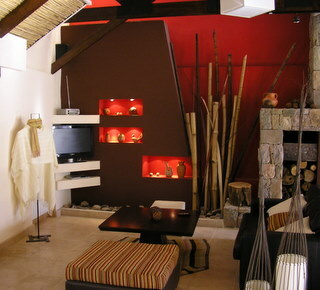 The modern, split level interior, dominated in the lower lobby by a large circular open fire place, is decorated with Andian art. A glass walled dining room overlooks the mountains beyond. 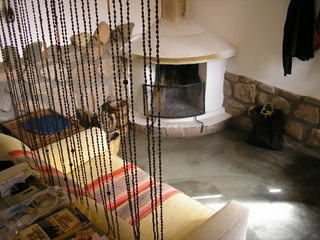 The upper lounge has comfortable couches, a wide screened TV and a subtlety lit large stone fireplace. 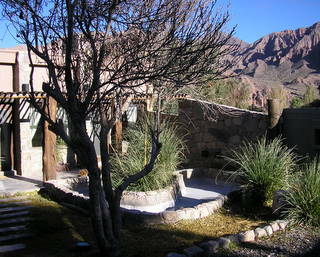 A small pool is in a side garden for summer swimming. Outside the main building, the rooms spill like a salmon colored adobe village enclosing a lush green lawn - this was winter - and gardens were lush with succulents and flowering cactus. 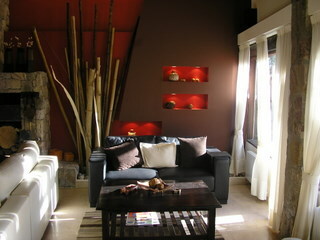 Each room is individually decorated with original art work. 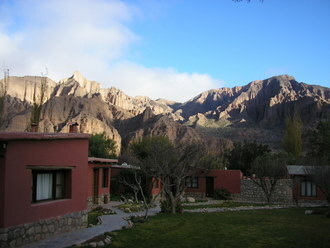 Our queen size bedroom had lower sitting area with a fireplace and beautiful views of the Quebrada mountains. 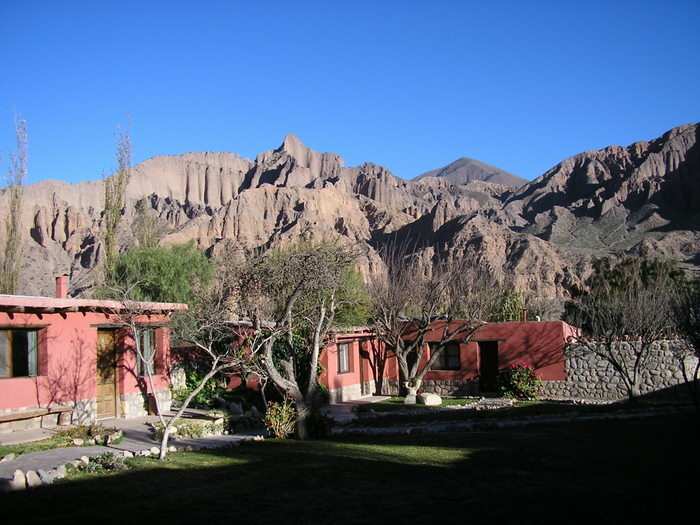 The fireplace in the superior rooms provide welcome heat on cold mid-winter Andean nights, but the draft of the fireplace needs to be improved. A roaring fire is needed to create and maintain a draft otherwise smoke drifts into the room creating an uncomfortable atmosphere. Fire wood is available in the garden. An excellent breakfast buffet of ham, cheese, breads, jams, fruit, juices and coffee, tea, mate was available in the morning. 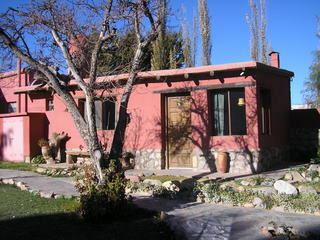 Posada Con Los Angeles is peaceful, very comfortable, beautiful and has attentive service. We stayed five nights and could have just relaxed for many more. 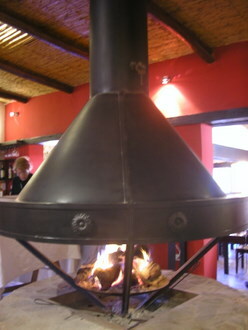 For a superior double (with fireplace) was AR$292 (US$78.00).